← Falls Festival at Neomonde Cafe in North Raleigh – Saturday October 6th! This month my tour of the great local coffee scene takes me to Durham for a visit to Respite Cafe. 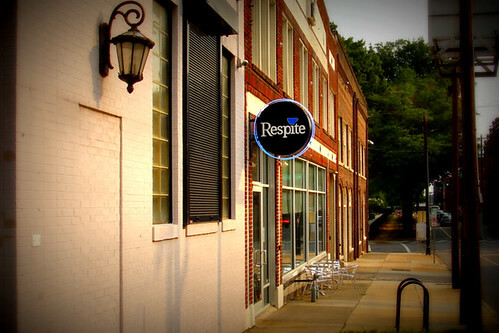 Respite is a relatively new coffee shop in downtown Durham owned and operated by local resident and Duke alumnus Courtney Brown. The Cafe is conveniently located along Duke Street just around the Corner from Brightleaf Square (map). I have had Respite on my radar for a while now and was fortunate enough to pay several visits over the past few months. I find the cafe’ to be a great place to relax and recharge whenever I am over in Durham exploring downtown. 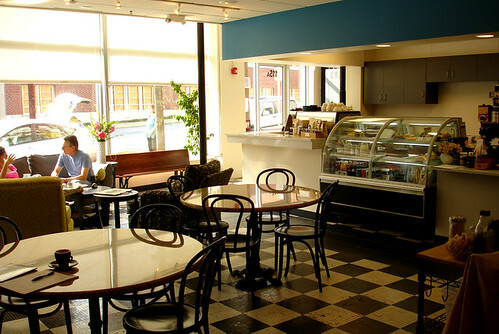 Respite is housed in a building constructed back in 1929 and its interior is a little different than what you typically see in other local coffee shops, with its blue and white painted walls and original black & white checkerboard tile floor. However, the style fits the building perfectly and breathes new life into its space by creating a cafe with a 1920’s vibe infused with a modern touch. I find the interior calming and relaxing making it a great spot for catching up on work while enjoying my coffee. 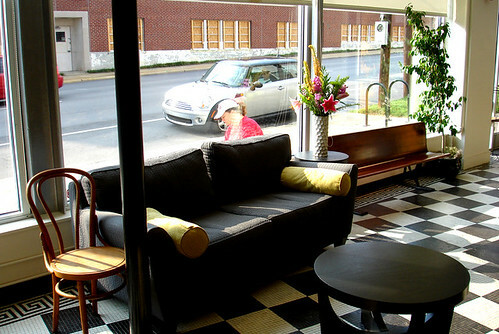 There are several different seating options in the cafe, ranging from large tables that seat 4-5 people to cozy table tops, and comfy couches for relaxing along the window and in a smaller more private alcove in the back of the cafe. Their is even a small meeting room in the back that can be reserved for study groups or business meetings. On my more recent visits I’ve noticed Respite is a popular destination for Duke students . 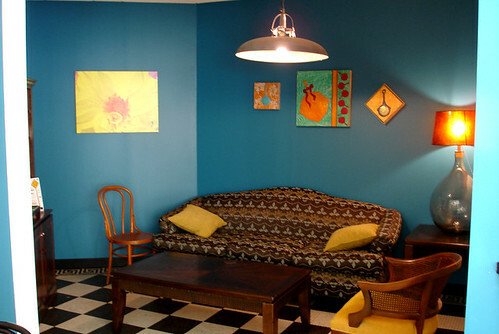 However, although it is a great place for studying it is also a great place for relaxing and conversation, lending the space more towards a community “living room” vibe in general which I like. Respite serves locally roasted Carrboro Coffee which is one of my favorite local coffee roasters. Their high quality beans make for incredible espresso drinks that I find to be rich and well balanced. The organic homeland creamery milk Respite uses to make their lattes, my favorite drink, gives them a silky smooth texture that I love. 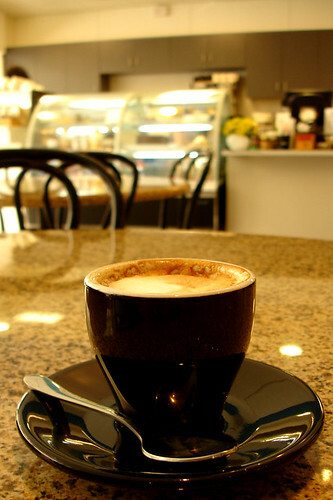 Respite offers a full line of coffee and specialty espresso drinks. You can purchase coffees prepared via various different methods including traditional pour-overs and the Chemex method. In addition to great coffee, they also serve an extensive offering of 20+ different organic teas from Rishi Tea. Complimenting the great coffee and tea at Respite are the abundant local food products they sell. This is one of the great highlights of the shop. 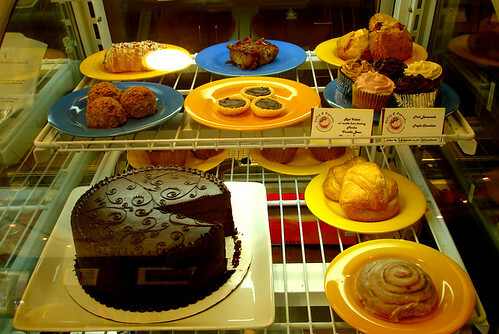 Their pastry shelves are always filled with offerings from local and regional bakers including some amazing deserts from the people at Crumb in Raleigh that can be best described as edible works of art. Other baked goods featured are Kelly G’s cupcakes from Carrboro and Kismet artisan crackers from Durham. I’ve also recently learned that respite now also offers gluten free vegan baked goods from Zen Cat Bakery, cookies from Kukia’s Cookies, and gourmet popcorn from Durham’s own Mad Popper. Offerings vary weekly but there are always lots of great food options to pair with your drink. You can view a full list of their locally sourced products on their website here. I enjoy coffee shops that feature a lot of natural lighting and love all the windows at Respite that look out along the sidewalk and Duke Street. It allows for natural sunlight to pour into the shop giving it warm feel that helps create a nice transition from the quite interior to the hustle and bustle of the outside world. On my visits I often found myself staring out the window daydreaming as I watched the world pass by as people make their way to work and class. This is exactly why I like spending time in a coffee shop like this. It isn’t just about getting in and out with a great cup of coffee, it is also about the experience and taking time to enjoy your surroundings. I think Respite is a great addition to the blossoming local coffee scene in the Triangle and look forward to visiting them again the next time I explore Durham. Respite’s Falls/Winter hours are 8am-8pm Monday through Saturday. 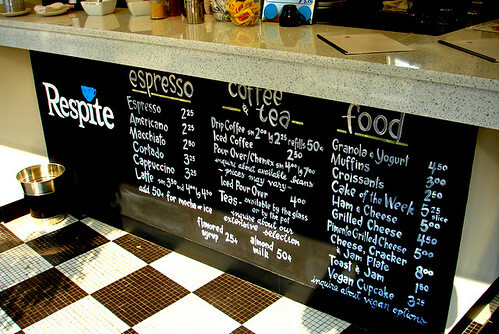 For more information about Respite check out their website and facebook page or follow them on twitter at @Respite Cafe.